– Foodie Baby’s nursery. Foodie Groom and I painted the nursery ourselves. Bunnies, dragon flies, and all. First baby. First nursery. But not the first time I cursed that stupid blue painter’s tape. I used to think that there was no such thing as bad pizza. It was easy to believe because I was living on bad pizza. During college, I was a connoisseur of cheap freezer pizzas. 10 pizzas for $10. Of course, the freezer in my apartment only held 8. And half of that space technically belonged to my roommate… I have a habit of getting bogged down in details, especially those details that don’t matter. 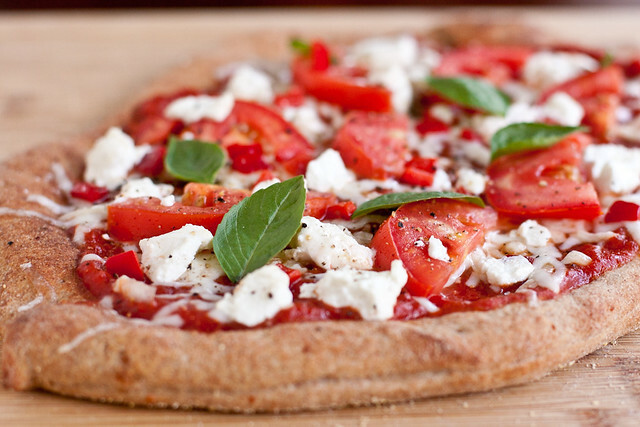 A meatless pizza topped with fresh tomatoes, red bell pepper, goat cheese, and basil. Preheat oven to 450. Turn dough out onto a pan or peel dusted with cornmeal. Shape the dough into a 14-inch round and transfer to the oven. Bake for 7 minutes, docking any air pockets that form with a fork. Make the sauce: Heat oil over medium heat. Add garlic, red pepper, and a few grinds of black pepper and cook until the garlic just begins to brown. Add tomatoes and simmer for 15-20 minutes. Salt to taste. 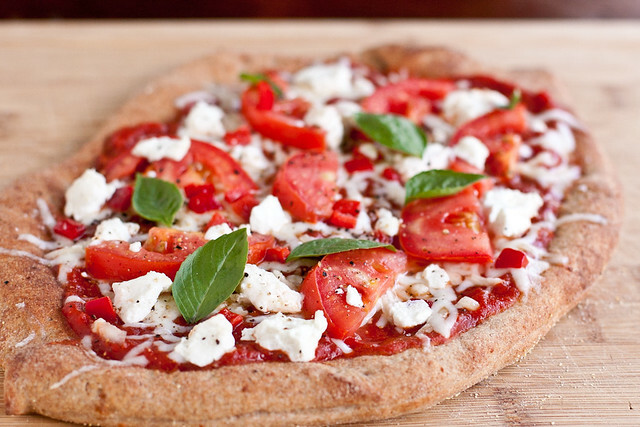 Assemble the pizza: Top the crust with sauce, shredded mozzarella, tomatoes, red bell pepper, and goat cheese. Transfer back to the oven to melt the cheese and brown the edges of the pizza. Top with basil leaves before serving. Yum, this pizza looks delish! We had homemade pizza 4 nights out of the 6 we were at home last week. Welcome to your new home (and kitchen)! 🙂 That pizza looks great. I finally made my first pizza entirely from scratch a few months ago and it was totally worth it! That pizza looks so delish. Congrats on the new home! Krystle – it’s on Jones between Grant and 1960. Congrats on the new home and that pizza looks delish! 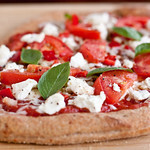 I love a good whole wheat crust and I’ve never included wheat gluten – does that help the texture? Ellen – I think it definitely improves the texture in a quicker rise. The dough is a little fluffier and more tender. Ah, you moved! I was wondering where you had gone! Congratulations on a new home and here’s to finding lots of tasty eats in your new ‘hood! YUM – this pizza looks awesome. I love homemade pizzas. Congratulations on the move!! I LOVE a good pizza, but have had more than my share of bad ones [I love trying out new places, most of them end up closing down a week or two later :P]. Congratulations on your new kitchen, I mean house! Mmm this pizza looks divine. I’d love for you to submit one of your beautiful photos, and a link to your post, to my new vegetarian food photo gallery showcasing beautiful and flavorful vegetarian food. I use active dry. Either will work, you just skip the proofing step with instant.